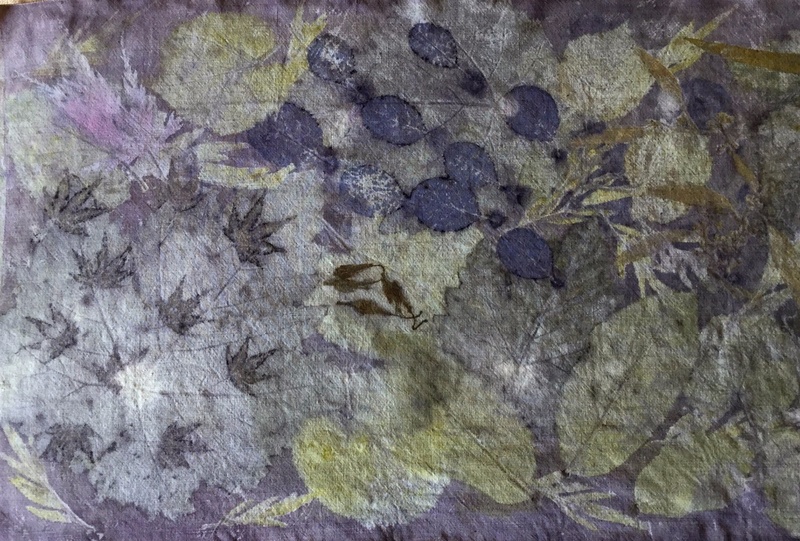 Ecoprinting, or botanical contact printing, is a contemporary adaptation of the ancient art of dyeing cloth with plant based pigments. Leaves are arranged on cloth, which is then tightly bound so that leaves and fabric are in close contact. Application of steam or immersion in a vat of natural dye coaxes the pigment out of the leaf and into the cloth. Treatment with naturally occuring substances such as soya, alum, or rust solution enhances the colours and makes them more colourfast and lightfast. Addition of natural dyes such as madder, logwood and indigo extends the palette of colours achievable. These dyes come from sustainable sources - many are grown in my own garden.The naturally produced colours are soft and harmonious, and the process is non polluting and respectful of the environment. The smallest change in plant species, climatic conditions or water source can produce marked variations in the prints, meaning every piece of cloth is unique.